Padfolios are part of any well-organized meeting essentials and often need to represent the presenters brand image. PackZen will customize your padfolios in various colors and styles that will fit any marketing budget. 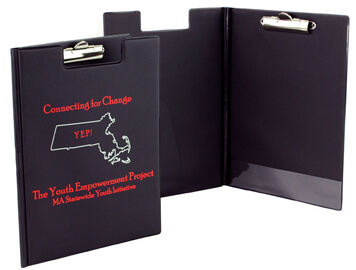 Custom padfolios are perfect for companies as promotional gifts or meeting document organization. They can be constructed from multiple material styles and colors and have single to multiple fold capabilities depending on the content thickness. They come with options for no closure or flap closures designed to your exact specifications. File pockets can be attached as well as business card pockets including a pen loop and a ruled memo pad. By adding custom print decoration your customers or employees will have a product that will represent your unique brand messaging with a lasting impression. Professional image representation and design are easily created for your sales presentations, corporate meetings, catalogs, training manuals and employee handbooks.